SPRINGFIELD, Ohio -- The Mount Union men's volleyball team fell to Wittenberg it their season opener, 3-0, at the Pam Evans Smith Center Tuesday night. Despite the loss, the Purple Raiders (0-1) were led by the freshman duo of opposite hitter Mark Bruns (Columbus/Upper Arlington) and outside hitter Justin Sibbel (Stow/Stow-Munroe Falls) as they each tabbed six kills each. Setting up the offense was freshman setter Jeremy Leyden (Cuyahoga Falls/Archbishop Hoban) as he dished out 13 assists on the night. 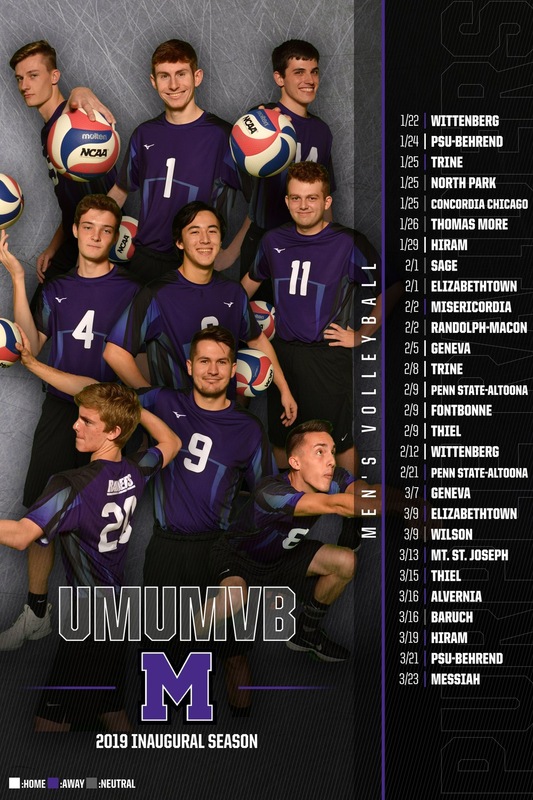 Sophomore libero Andrew Chen (Brookyn City, Minn./Park Center Senior) defended Mount Union territory as he led the team with 13 digs. At the net, freshman outside hitter Kaleb Krebs (Pittsburgh, Pa./Seton LaSalle) registered a pair of blocks in the Raiders debut. Mount Union got two quick kills off Sibbel to claim their first lead in the first set. Wittenberg jumped ahead early to take the lead at 8-6 before scoring six unanswered points, increasing their lead 14-6. After a Mount Union timeout, the Raiders were able to start chipping away and get within five points at 15-10. Wittenberg was unable to hold off the Raiders and close out the set winning 25-13. Sibbel continued to work in sync with Chen at the start of the second set but Wittenberg put a stop to Mount Union's offense and claim a 20-7 lead over the Raiders. A pair of kills from Sibbel and Sam Matonis (Macedonia/Walsh Jesuit) fueled a brief comeback but Wittenberg would come out on top, 25-12. Final set, Mount Union and Wittenberg rallied back and forth to remain within a point of each other. After only leading 12-8, the Tigers eventually pulled ahead to extend their lead to 19-8. Mount Union tabbed six more points alongside Wittenberg as the third set ended in favor of the Tigers, 25-14. Mount Union will return home to host Penn State-Behrend in their first home game Thursday, January 24 at 7 p.m.